There is a moment in "Bonnie and Clyde" when Bonnie, frightened and angry, runs away from Clyde through a field of wheat, and as he pursues her, a cloud sweeps across the field and shadows them. Seen in a high, wide-angle shot, it is one of those moments of serendipity given to few movies. Today the cloud could be generated by computers; on the day the scene was filmed in Texas, it was a perfectly timed accident of nature. The cloud carries foreboding; Bonnie and Clyde are doomed, and uneasily realize it. Not long after that scene, Bonnie has a final reunion with her mother. By then Bonnie Parker (Faye Dunaway) and Clyde Barrow (Warren Beatty) are famous outlaws, celebrated in the press as populist bank robbers in an America gripped by the Depression. Bonnie speaks wistfully of marrying Clyde and moving in next door to her mother. "You live within a mile of me, honey, and you'll be dead,” her mother flatly pronounces. They would indeed die, in a hail of bullets that permanently changed the way the movies depicted violence. But their lives provided a template that would be used time and again in later films; as the ads put it, "They're young ... they're in love ... and they kill people.” From "Bonnie and Clyde" descended "Badlands," "Days of Heaven," "Thelma and Louise," "Drugstore Cowboy," "Natural Born Killers" and countless other movies in which ordinary people were transformed by sudden violence into legend. 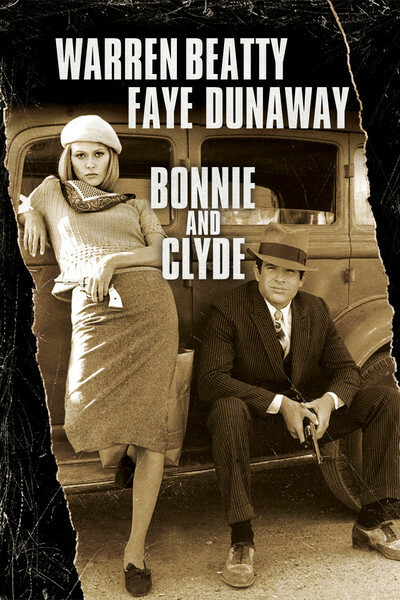 "Bonnie and Clyde," made in 1967, was called "the first modern American film” by critic Patrick Goldstein, in an essay on its 30th anniversary. Certainly it felt like that at the time. The movie opened like a slap in the face. American filmgoers had never seen anything like it. In tone and freedom it descended from the French new wave, particularly Francois Truffaut's own film about doomed lovers, "Jules and Jim.” Indeed, it was Truffaut who first embraced the original screenplay by David Newman and Robert Benton, and called it to the attention of Warren Beatty, who was determined to produce it. The legend of the film's production has become almost as famous as its heroes. Stories are told about how Beatty knelt at the feet of studio boss Jack Warner, begging for the right to make the film. How Warner saw the original cut and hated it. How the movie premiered at the Montreal film festival, and was roasted by Bosley Crowther of the New York Times. How Warner Bros. determined to dump it in a chain of Texas drive-ins, and how Beatty implored the studio to give it a chance. The movie closed, but would not go away. The soundtrack, bluegrass by Flatt and Scruggs, went to the top of the charts. Theodora Van Runkle's berets and maxiskirts for Dunaway started a global fashion craze. Newsweek critic Joseph Morgenstern famously wrote that his original negative review had been mistaken. The movie reopened, went on to become one of Warner Bros.' biggest hits and won 10 nominations (with Oscars for supporting actress Estelle Parsons and cinematographer Burnett Guffey). But that is only the success story. More important was the impact the film had on the American movie industry. Beatty's willingness to play a violent character with sexual dysfunction was unusual for a traditional 1960s leading man. In a famous Esquire profile by Rex Reed, which appeared as the movie was opening, he was dismissed as a has-been pretty boy. "Bonnie and Clyde" put him permanently on the Hollywood map. Beatty and director Arthur Penn cast the movie mostly with unknown stage actors--so successfully that all the major players (Dunaway, Parsons, Gene Hackman, Michael J. Pollard, Gene Wilder) became stars on the basis of this film. Behind the camera, the movie launched the careers not only of Van Runkle, but also of editor Dede Allen (a New Yorker breaking into a closed shop) and production designer Dean Tavoularis, who went on to work on Francis Ford Coppola's "The Godfather" and "Apocalypse Now." And the cinematography of Guffey launched a whole new wave of its own, of films shot and edited in the more impressionistic French style. Arthur Penn came fresh to the project after a resounding failure ("Mickey One," a self-conscious but intriguing art film) also made with Beatty. His later credits included "Night Moves," "Alice's Restaurant" and "Little Big Man." Co-writer Robert Benton became an important director ("Kramer vs. Kramer," "Places in the Heart"). It's as if that one film sent all those careers cascading down to the present day. It was a film in which all of the unlikely pieces were assembled at the right time. And more than anything else, it was a masterpiece of tone, in which the actors and filmmakers were all in sync as they moved the material back and forth between comedy and tragedy. The opening scenes are lighthearted, starting with Clyde's bravado after Bonnie catches him trying to steal her mother's car. She senses in him, instantly, the means of her escape from a boring west Texas town. What he essentially supplies--for her, for the hero-worshipping gang member C.W. Moss (Pollard) and for the hungry newspaper readers -- is the possibility of glamour in lives of drab poverty. "We're the Barrow Gang," Clyde says, introducing them at the beginning of a bank robbery so they'll be sure to get credit. And one of the movie's great moments comes as Clyde lends his gun to a dispossessed black sharecropper so he could shoot at a bank's foreclosure sign. If Clyde offers glamour, Bonnie offers publicity. She writes "The Ballad of Bonnie and Clyde" and sends it to a newspaper, and she poses for photos holding a machinegun and a cigar. Clyde's brother Buck (Hackman) is more level-headed, more concerned with bank jobs than newspaper headlines. He comes attached to Blanche (Parsons), whose whiny complaints get on Bonnie's nerves (when agents surround one of their hideouts, she runs screaming across the lawn, still holding the spatula she was using to cook supper). Penn directs the film as a series of set-pieces, which remain in the memory, focused and clear. The Okie camp where homeless farmers, tractored off their lands by the banks, hunch over campfires. Bonnie's sad, overcast, foggy family reunion. The bank robbery that goes all wrong when C.W. stupidly parks the getaway car. The way laughter turns blindingly to violence, as when a stickup ends with a meat cleaver and a sack of flour, or when a getaway ends with a bullet in a bank man's face. The run-in with a state trooper (Denver Pyle) who is made to pose with Bonnie and Clyde, and then unwisely released. The scene where C.W., a gas station attendant, leaves his job and runs off with the gang that's just robbed him. The scene where C.W. 's father effortlessly browbeats his wimpy son for getting a tattoo. And then the slow-motion ballet of the final execution. Today, the freshness of "Bonnie and Clyde" has been absorbed in countless other films, and it's hard to see how fresh and original it felt in 1967 -- just as the impact of "Citizen Kane," in 1941, may not be obvious to those raised in the shadow of its influence. When I saw it, I had been a film critic for less than six months, and it was the first masterpiece I had seen on the job. I felt an exhilaration beyond describing. I did not suspect how long it would be between such experiences, but at least I learned that they were possible.